A 20-year-old restaurant continues the practice of offering healthful soups. THE Chinese take their soups very seriously. More than just a food type, Chinese soups are often medicinal, serving to ?heat?, ?cool? or regulate the body as prescribed. Thus, Chinese soups aren?t just a random mix of meat and vegetables, but are chosen combinations which use the properties of the foods for a particular result. Any Chinese medicinal hall sells soup mixes ? packets of dried herbs with unpronounceable names in plastic packets, with cooking instructions. These are recommended, depending on the condition of the customer: lack of energy, feverish, recovering from childbirth, and so on. Traditional Chinese doctors often prescribe mixes of herbs to treat various conditions, with detailed preparation instructions for boiling, steaming or double-boiling. Not for nothing is the traditional Chinese herbal soup often an essential part of the family meal. The best known Chinese soup, which has staged a breakout into popular fare and is taken for its taste rather than therapeutic properties, is Bak Kut Teh, originally a prescription as a roborant (tonic) and an aphrodisiac, and still widely available in dried packet form from Chinese medicine halls. Stepping into Veng Soon restaurant, one had to pass two large steel steamers with metal drawers. Every time one of the drawers was opened, a cloud of steam escaped, revealing bowls of soup neatly arranged within. A bank of high-powered ventilators above the steamers sucked the steam noisily from the restaurant, but it was still rather steamy within. If there was any doubt what this restaurant specialised in, the large menu plastered on the side wall quickly dispelled it, for the words ?STEAMED SOUP? headed up the board, followed by 17 different soup types. These ranged from the ordinary, such as the ?Lotus Root and Peanut Pork Rib Soup? to the slightly exotic ?Squirrel Herbal Soup? to the truly exotic ?Shark Bone and Kampung Chicken Herbal Soup? to the price-topping ?Winter Melon Kampung Chicken Soup?, with prices displayed alongside each type of soup. A smaller card by the side advertised the rest of the menu, comprising Claypot Chicken Rice, vegetables and drinks. No doubt here as to what got top billing. The restaurant was a typical, no-frills Chinese restaurant populated, even at a relatively early hour of the evening, by Chinese diners with their families, all displayed in the informal style of eating out, Malaysian-style: flip-flops, shorts, flapping T-shirts, with grandpa, grandma, children and grandchildren in tow ? true family dining. My dining party ordered a few soups, which arrived quickly, since all that was needed was to retrieve the soup with a pair of pliers from the steaming drawers. 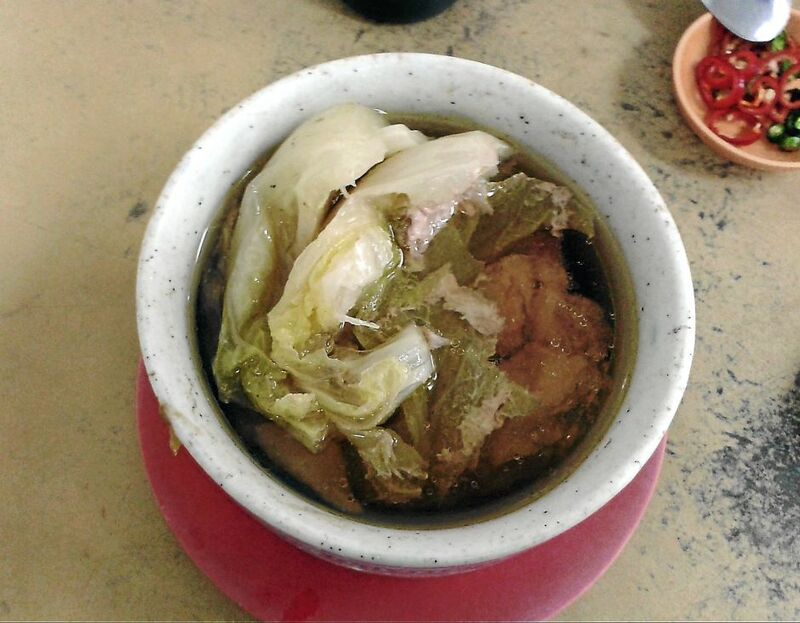 First up was the Dried Scallop, Chinese Cabbage and Kampung Chicken Soup (RM10). It came in a thick-walled soup container, covered by leaves of the Chinese cabbage, which is a white vegetable. The soup was clear and thin, and also contained Chinese mushroom and small pieces of chicken so thoroughly cooked that it fell off the bone. The meat, although it can be eaten, is typically added for taste and body. Usually, it is quite tasteless after prolonged steaming, with its ?goodness? or nutritional value believed to have leached into the soup from the cooking process. The soup, in spite of its clear appearance, was wonderfully smooth, with the slightest hint of a smoky flavour from the combination of Chinese scallop and mushroom. The Chinese cabbage added sweetness to the soup. The next soup, the Coconut Chicken Herbal Soup (RM8), came in a complete coconut with the top lopped off. It was an old coconut, as evidenced by the thick rind within. The soup inside was a mysterious dark colour, like Bovril or Marmite, with the strange shapes of herbs within. I recognised wolfberry. The soup was thick and heavy, with a thin layer of oil from the coconut, and the taste was a revelation: it was sweet, with a heavy undertone from the meat and herbs, and it had an intense flavour. Chinese soups generally do not use thickeners such as Western soups do, but as Chinese soups went, this was a thick soup. The coconut rind was stained brown from the dark soup, which was due to the herbs. It was a very ?yang? soup compared to the ?yin? of the previous one. The last of the soups was the enigmatically-named Black Bean Cat Fish (Loach) Soup, (RM7) and like the Coconut Chicken Herbal Soup, it was a dark coloured soup. However, it was relatively thin, and a quick stir of the spoon dredged up black beans, still intact after prolonged steaming, and chunks of bony fish stained dark from the beans. The soup was also sweet, but in a totally different way from the Coconut Chicken Herbal soup. There was no hint of fishiness, and it could easily have passed a blind test as a chicken or pork soup, except for the relative lightness of body. Like the previous two soups, it was also very tasty and the black beans retained their firmness and were good for a chew. Since one can?t have only soup for dinner, Claypot chicken rice was the main dish, with a large pot costing RM14. It was cooked in a long row of claypots arrayed over a gas range in the kitchen, and it arrived with slices of Chinese sausage, pieces of chicken and the added order of an egg (RM1 additional). Salted fish was an additional option. A scoop of dark sauce over the cooked dish added a brown colour and also provided taste. However, it didn?t distinguish itself, and was very much a supporting act to the soups. We also ordered a plate of vegetables, a large serving of sawi (RM9) which had been blanched, with fried chopped garlic in oil and oyster sauce added. Home-brewed herbal teas cost RM1.50 a glass. Eating in the restaurant was a sweaty affair; besides the retained heat within the restaurant, stirred vigorously by ceiling fans, the soups were served hot, as was the claypot rice. Veng Soon has been in business in the same shop in PJ Old Town for some 20 years, having moved from another, earlier shop in the same vicinity. It is something of an establishment for many residents who have been coming for years to this family-run business. PJ Old Town still retains some of its character as the original nucleus of Petaling Jaya, with a clutter of traffic in the narrow roads, the one-storey houses sprawled around the commercial area, and many old-style eateries. The Chinese have incorporated invigorating, health-benefitting soups and tonics into their diets for thousands of years, part of the holistic view of well-being of Chinese medicinal philosophy, and Veng Soon, in its little corner of PJ Old Town, continues to practise that tradition.